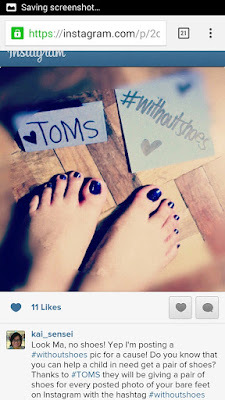 Brew of The Day: Join the TOMS WithOutShoes Campaign! Join the TOMS WithOutShoes Campaign! Hey Coffeeholics! Have you ever tried going to school barefoot? Without any shoes? (if not.. try to imagine na lang.. hehe) Well I tell you, I only tried to walk without shoes in the house and it can end up being painful especially if you accidentally step on something sharp! And that's just the basic benefit of shoes. Do you know that SHOES CAN INCREASE ACCESS TO EDUCATION? Providing children with school uniform, which often includes shoes, can increase school attendance by up to 62% (Source: Evans, 2009). And definitely, there are a lot of children who are in need. And you know what? We (yes that's YOU and ME!) can do something about it! All you have to do is take a photo of your bare feet, post it on instagram with the hashtag #withoutshoes before May 21. 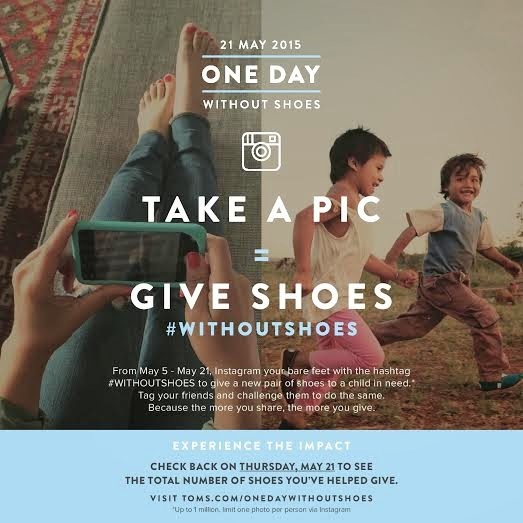 Each photo = 1 pair of shoes that will go to a child in need! How cool is that? Let's join TOMS in this campaign! I already did! :) It's one photo per person on instagram = 1 pair of shoes. It will only take a small amount of time to do this.. promise! And in that one snapshot.. a child will be blessed! This summer let's not just enjoy our vacation but also spread happiness to others. I already posted mine! hehe.. so if you haven't yet.. please do! Oh and if you go to http://www.toms.com/one-day-without-shoes on May 21, you will find out how many shoes was "raised" :) Don't miss out!